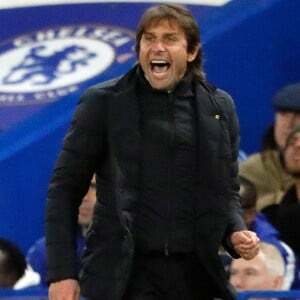 London - Antonio Conte has told any of his Chelsea players unhappy with a lack of game time that they should be grateful to play for the reigning Premier League champions. Willian and David Luiz have been out of Conte's first XI of late and the Chelsea boss is preparing to rotate his options throughout a busy December and January. Brazil playmaker Willian came off the substitutes' bench to score the equaliser in Saturday's 1-1 draw at Liverpool, when Luiz was an unused substitute. The defender, who lost his place to Andreas Christensen, is now out of Wednesday's home match against Swansea with a knee injury. "My players must be happy to play for Chelsea," Conte said. "They must be happy if they start the game or stay on the bench and come on. I have clever players to understand this situation, to accept this situation. "When you are in a great team you have to accept this. At the same time you must be happy to stay in a great team." Conte had been asked about Willian, who was linked with Manchester United last summer and has not started in the Premier League since the October loss at Crystal Palace. But the Italian's response also referred to Eden Hazard and Pedro, who have also served time among the substitutes this season. "Every game I have to try to make the best decision and try to protect every player," Conte added. "I'd like to start every game with the best players but at the same time this is not possible. This is not possible, otherwise I don't protect them. It's not easy to leave (out) great players to rest, but I have to do this." Chelsea trail leaders Manchester City by 11 points after 13 games ahead of the Swansea clash. Right wing-back Victor Moses could start, while striker Michy Batshuayi (ankle), forward Charly Musonda (knee) and the left-sided Kenedy (undisclosed) are still out.